Welcome to User Guide for AdminProject. Here you can learn how to perform various actions in AdminProject. Take your time to look through those guides and keep an eye out for new ones. They will keep appearing as we introduce new functions to AdminProject. If you have questions visit our FAQ and if that didn’t help contact us directly using the contact form. You’ve just signed up, have a project to run and are probably wondering where to start. Let us give you a few hints on how to transfer your project details to AdminProject and start working. After your first log in, you’ll be taken to a welcome screen and invited to take a short orientation course on the user interface. When done, you may click on My projects link on the right sidebar. The main work area is empty (unless you have been invited to participate in somebody else’s project) so the first thing you should do is Create a new project by clicking on the appropriate link on the right sidebar. Depending on the type of project you are running, AdminProject will set up a customised workspace for you. The selection you are about to make influences the general layout of the system in terms of work packages, intellectual outputs, activities, multiplier events and other components. While you can adjust the workspace later in the project settings, this selection will facilitate a smooth start. Choose an easily identifiable name and click create. You will then see the created project in your workplace and a sidebar with a few options to choose from. If you need to add or remove components you can do so in the project’s Settings. Your project space is ready. You may need to fill in several details you deem necessary. Go to the Settings tab in the project’s main view to select start and end dates and choose its colour ID. Type their e-mails into the invitation field. Click Invite after each e-mail. After all e-mails are added, click save in the box at the top of the page. Their names will appear on the list after they have successfully followed the instructions in the invitation e-mail. Owners – they have full rights over projects, they can create and change all projects’ settings, invite new people, add partners and upload their template. Administrators – are nominated by owners and assigned full rights within the project. You can assign the administrator’s role to someone who has already accepted the invitation to the project. 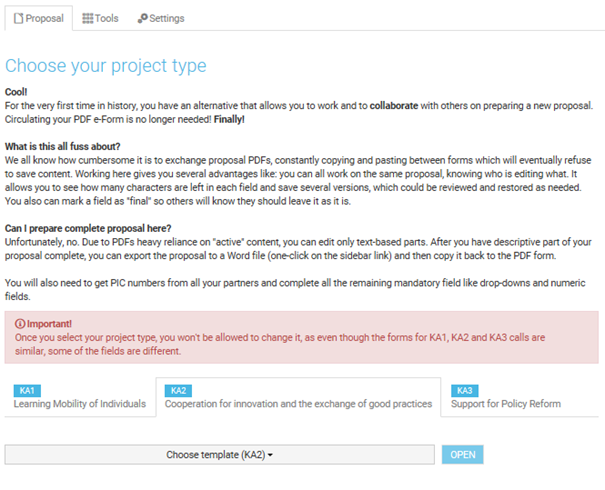 Users – have rights to create project items like tasks, travel cards, upload files etc. and can’t change any of the project’s settings. You can make a user an administrator by clicking on their name while in the Settings menu. Blue border indicates that they are an administrator. Do not forget to click save. Here, you should add project partners, essential for financial and dissemination purposes when you need to assign expenses or activities. Give them a number (like P0, P1) they have in your project, put in their name, choose their country and assign an acronym which will be used throughout the project. Do not forget to click save. In the lower section, match users with their partner organisations. It is worth noting that having a partner assigned to each user makes it easier to select people for tasks, timesheets and other modules, as their names will be accompanied with their organisation’s acronym. In this section you can upload your document template in .docx format, which will be used as a base for all documents generated by AdminProject. What we mean is a standard A4 page prepared in .docx format, with standard margins (each side 2,5cm/1in) and a defined header and/or footer. How to prepare a template? Create a blank document in your word processor (Word or LibreOffice). Insert and format required text and images to the header and the footer. Do not insert anything into the main body of the document. Such document can be uploaded to your project’s space. From now on, all exported documents will share the same header and the footer. If you need to display your company’s or the project’s logo, it can be uploaded and displayed at the bottom of each page in the project’s workspace. Maximum dimensions for the footer are 120px (height) and 1150px (width). Your footer will be resized and centered if necessary. When the work on the project is complete it should be sent to the archive. It is important for users of AP Standard and AP Business packages, as it will allow them to free up project space for new projects. Archived projects do not count towards the total number of open projects. An archived project will disappear from everyone’s workspace, it will only be visible to the project’s owner. They will be able to view the archived project in read-only mode. You can create proposals with a free account. Select Create a new proposal on the Actions sidebar. Then enter your proposal name and click create. In the Tools module, each user will find elements of AdminProject that help in day-to-day project management. When it comes to actual action, everything can be broken down into simple organic activities that are represented in AdminProject by Tasks. While tasks are not explicitly defined in any project proposal, they are the means of achieving your goals, producing deliverables and completing milestones. How does it work? Anyone can assign a task to a specific person or persons, it is usually done by the Project Coordinator or a Partner responsible for a specific Work Package. This person will set task start and end dates, choose responsible users and mark priority. To make sure your task is clear and understandable, add a description. People assigned to the task can attach files needed for completing the task, change task progress and leave comments. When the person assigned to the task completes their work or has made some progress, they can move the handle on their progress bar to reflect their actions. Afterwards, the task assigner should approve the task to definitely close it. Now let’s look at the details. All – displays all open tasks in the whole project, regardless of who owns them and who is responsible for completing them. Approved – returns a list of tasks that were marked as approved/completed by their owners. It can be used as task archive. In most cases, the list becomes very long. To find the tasks you are looking for click on the filters are inactive link in the top-right corner. It will allow you to see only those you are looking for. Right, now let’s move on to create and assign a new task. We may give Richard a task to create a course curriculum. We shall give him a sample file and one week to complete the task. Click Create a new task link on the right sidebar. Fill in the Name field and pick the start and end dates. Select from the list which Work Package or Intellectual Output does the task belong to in Part of WP or Part of IO (depending on project type). This field is not available if WPs and IOs are disabled in this project. If the list is empty, define a WP/IO in tools. Set the Priority – the default is Normal, other choices are High and Low. Owner – person who creates the task and assigns it to users. Responsible – person who is responsible for completing the work required by the owner. Observer – person who oversees and/or consults the progress of the task. Type in the description of the task. Add files that are a part of the task How to link files. Click save in the box above the task. Update the progress meter to let the owner of the task know that you are working on it. Leave comments with questions and updates related to your work. Upload and link files with the requested results instead of sending them via e-mail. As an owner of a task, pay attention to the progress bar. When it reaches 100% it means that the task is completed and awaits your approval. If you are happy with the results change status of the task to Approved: Yes. Did you know you can reply to comments using only your e-mail? Whenever you receive a notification about changes in a task or about a new comment, hit reply in your e-mail client and type your message. Make sure that everything is placed above this message ** Please reply ABOVE this line to add your message to AdminProject **. To-do list is a helpful way of seeing all your tasks from various different projects. You may receive it by e-mail every day if you wish and set up the frequency and size in your Profile. Since it is the best point of reference for everything you need to do or to have done, you can find the link to your to-do list on the sidebar menu in several places across AdminProject. The list contains all tasks that are connected to your user account, so you will see both: tasks you created and tasks you have been assigned to. This tool’s function is similar to those of message boards and mailing groups. Users create threads, post replies, add files, links and citations. The philosophy behind it is fairly simple: to keep everyone informed and provide space for exchange of ideas and information. Unlike comments in Tasks, by default each new discussion topic is delivered to everyone in the project. We know that there are issues that some people might not be interested in following and would like to reduce the number of e-mails delivered to their inbox (in heated discussions we are talking about tens or sometimes even hundreds of posts). author of the last post. You can filter the discussion board by the number of post responses or views, date and unread posts. To start a discussion all you need to do is click Start a new discussion on the Actions sidebar or on the button at the bottom of the list. Below the text field, click Deliver to all project members and select/deselect users you need/do not need to inform about the topic. Attach files that are relevant to the discussion. Click Post this message button below the text box. Discussions are open. They are available to all users within the project. Even if you have all notifications switched off, you can still follow topics in your browser and post replies in any discussion. To post a reply just click the Post a new reply button below the last post. The Subscribe to this discussion and Unsubscribe from this discussion links allow you to manage your subscriptions. They are working only when you have notifications enabled in your Profile. AdminProject can store files related to all of your projects while keeping each project’s storage separate from another. There are many other cloud storage solutions available, but files uploaded to AdminProject can be easily attached to other modules e.g. tasks, dissemination activities or travel reports. System folders automatically gather files attached to their respective module and users cannot upload files directly to them. If you add any dissemination evidence to your dissemination activity you will be able to find it in the Dissemination system folder. Below the name of the file, there is its size, by whom and when was its latest version uploaded, number of comments and number of versions. You can sort files by name, last modification date, file type, size and by whom uploaded. When you hover over the file’s row you will see available operations: to comment, rename, move, delete or download the file. You can also click on the file row to mark it and then download, delete or move the selected items. To upload a file click on a sidebar link Upload a new file. The upload form gives you two ways of uploading a file. By clicking Select files, you open a system file browser to select a file or files. The other way to upload files is to drag and drop all files into the large gray box below. The files upload automatically and, depending on your upload speed, you will see a progress bar for each file. Small files on fast connections will usually not display a progress bar. The method of uploading files is the same across all modules, so when you want to link a new file to a task, you will see the same dialog box. Single file – click on the filename. Group file download – click on the rows with files you want to download to highlight them. You can also select folders to be included in the downloaded package. When ready click Download button that appears on the hovered row or click on Download selected items. A .zip file with requested files and folders will start downloading. Complete download – to download all files and folders (with files and folders inside them) visible on the list click Download current folder. AdminProject’s file manager offers basic functionality in terms of moving, renaming and deleting files. Those options will appear when you hover over a filename. To rename a file, click Rename, type the new name in the field provided and click the blue button. To move a file, click Move, select the target folder on a folder tree and click the blue button. To delete a file, click Delete and in the confirmation window click the red button. This operation has been enhanced with soft-delete feature. It means that before a file (or a folder) actually gets deleted it will be held in the limbo for deleted files for 30 days. If you delete any file on AdminProject, you’ll be able to restore it for another month. After that, the file will be removed permanently. Deleted files can be viewed and restored by the Owner and Administrators. Find Show deleted elements link and click to toggle the view of deleted files. They are marked as (deleted) and are placed in red rows. There is no such thing as Trash or Recycle Bin, the files are just hidden from users’ view in the same place they were before deletion. You can also perform these operations on groups of files and folders. Just click on the rows you want to delete/move/rename then select the desired option from the hover menu or from the Actions sidebar. Whenever a file is uploaded to a folder, AdminProject checks if a file with an identical name already exists. If the check is positive the file is replaced and the old file is added to the version history available after clicking on the version icon. Save it under the same name. Upload the file to AdminProject. Version history allows you to track the people who upload further revisions and to revert changes by downloading a previous version of the file. Locate the Link a file button or click to see the available files and folders. Select the files you want to attach by clicking on their names. Click save in the alert box. Now the files can be accessed from the module and if no longer needed they can be detached. If the file you want is not on AdminProject you can always upload it without leaving your current module. If you click New file button it will bring up the dialog box described earlier. Remember, it will be uploaded to the current folder and linked to your task or report. Making arrangements for each project meeting can be an arduous task, having to include all your partners’ schedules and plans and trying to squeeze the meeting right after the completion of a work package. Debates on dates can often take a lot of time. This little tool should help you see what dates are most feasible for all invited participants. The main view of the Meeting Planner shows all planned meetings. To plan a new meeting look for the proper link on the sidebar. Enter the name of your meeting or event. Create a pool of dates that are available for the meeting. Select dates by clicking the days you want to select. Type the dates into the text box provided (more useful if you want to select the whole month). The format for dates is DD.MM.YYYY, different dates should be separated by a comma and if you want to select a range of dates use hyphen “-” e.g. 05.05.2014-20.05.2014. If you type the dates manually, the dates selected on the calendar will be overwritten. Select users who are to be notified about the new planner. They will receive an email and be asked to respond by selecting suitable days. When everything is set click Save and share button. When a user has been invited to give a response to a meeting planner they will see a prompt on the sidebar under Pending Items. They can access the planner by clicking show button or reject the invitation by clicking ignore. Everyone (not only the invited users) can access the planner by navigating to Tools > Meeting Planners and clicking Fill in next to the meeting. They will be taken to a screen with all possible dates chosen by the creator of the meeting planner. Clicking on a day will change its colour into green – this indicates that you are available for the meeting on that day. Click all days that suit you and end by clicking Save my availability button. Once everyone responds (or at any time before that) you can check what days are conflicting with peoples’ plans and which are good for the meeting. Users can make alterations in their choice of days available for the meeting in the case of change in plans. The module will compare available dates and will suggest such days that are suitable for all (and for some) users. When the time for decision is over, put the best date into the calendar and inform every one of the necessary details. Delete out of date planners by using the link on the sidebar. Optionally milestones and deliverables, if defined in Work Packages. It gives you a better overview of what is going on in your project, how long till it needs to be done, when do next activities start and where you should speed up because deadlines are due too soon. Left sidebar represents the list of all available elements. When first opened you will only see the names of the parent and unassociated elements. Work Packages and Intellectual Outputs with sub-elements can be expanded to reveal associated tasks, milestones, deliverables or activities. How to figure out which is which? WP/IO are the grey-blue line at the top of cells with each end wrapped by a triangular bracket. Tasks are the blue boxes spanning their whole working period. Milestones are represented by dark blue diamonds. Deliverables are represented by small stacked boxes. Events are striped blue bars. It may look a bit unclear without descriptions, but if you hover your mouse pointer over an element you’ll see its name and start/end date in a tooltip. Double-clicking on the name on the list of all elements will scroll the view and centre on the element. The top bar has three sections representing years, months and days. Clicking on each of those elements will zoom in or out to make it fully visible and centre the view on it. For instance, when you want to see the whole year just click on it and see the image zoom out to show you all 12 months of the given year. The main purpose of the Galleries is to document project meetings and project related events like dissemination actions or conferences. Your photos can be grouped in albums and viewed as a slideshow. Larger images will be scaled to the size of your window. Enter the name of your gallery. Click on the blue tick box. Click Upload photos button and select files to upload. Once they upload, you will be taken to the thumbnail gallery with your photos. Here you can click and view them manually or start a slideshow. At any time you can manage your gallery and decide to either upload more photos or delete selected ones. Galleries can be downloaded to your computer. Click ‘Add a new event’ on the right sidebar. Fill in the name of the event and its description. Select dates using the date-picker bubble. The calendar can also display milestones and deliverables if they are defined in Work Packages. The calendar is shared among users across the project space and is another way of viewing your dates and deadlines. Projects can be divided into smaller pieces of work called Work Packages (WP). They represent specific blocks of work and each WP needs deliverables which represent – an effect or result of a particular WP. AdminProject has a specific module which allows you to define all your WP “belongings” – like deliverables, milestones and tasks needed to achieve the former. Let us guide you through the basics of WPs. Depending on the project, you can have a different number of WPs with a different number of deliverables and various timelines. It is a good idea to fill that in at the beginning of the project. To start working with Work Packages, head to Tools tab and then click the Work Packages button. You should see the list of all Work Packages. If nothing is there, decide on creating one. Click on Create a new work package link on the sidebar. Fill in the name, start and end dates. Add an acronym (acronyms allow you to identify the work package in other modules of AdminProject). Now, with the Work Package saved, we can add milestones and/or deliverables. Click on the Work Package and then choose one of the links on the sidebar or the blue button that appears after you expand the sections Deliverables or Milestones. You need to type in the name, the deadline – meaning: when it has to be done, and a description. Then click save. Both Deliverables and Milestones will be visible in your calendar and Gantt Chart. Defining these items takes only a moment, but will help you track your project’s progress and quickly find out what should be available and when, as opposed to scrolling through the project proposal. In addition to milestones and deliverables there is a third section – Tasks. It displays all tasks that are assigned to this particular Work Package. You can start adding tasks relevant for this WP by clicking Add a new task available on the Actions sidebar. Then you can set deadlines, assign persons responsible for the task, match task to part of WP (or IO), decide on priority, add description and link files. When everything is completed it will help you track your project’s progress and quickly find out what should be available and when, as opposed to scrolling through the project proposal. Spend some time on setting up the Work Packages. Take your application form and create work packages in AdminProject. If there is a result, add it as a deliverable. If achieving a deliverable requires going through certain stages, add them as milestones. Intellectual Outputs were introduced in Erasmus+ programmes and they replaced Work Packages in Strategic Partnerships. They represent the most importart results/tangible deliverables, such as curricula, pedagogical materials, open educational resources, IT tools, etc. Users can define Intellectual Outputs in accordance with the grant application form and as a result have an overview of activities that need to be completed to achieve a particular Intellectual Output. Click Create a new Intellectual Output. Insert the title for the IO, as in the Application. Copy the identification code from the project’s proposal (in format O1, O2, O3). Choose start and end dates for this IO, as in the Application. Copy and post IO description from the Application. Type and select the languages this IO will be delivered in. Type and select types of media used for delivery of this IO. Provide a short task description. Click save in the alert box above the IO form. Enter the Activity title, as in your proposal. Enter the Activity code found in your proposal. Select Project phase from the dropdown menu. Pick start and end dates. From the list of partners select Leading organisation to lead this Activity. Participating organisations who assist in this Activity are selected from a similar list. You can select more than one organisation. Fill in the description of the Activity, as submitted in the proposal. Fill in the role of each organisation in this Activity, as submitted in the proposal. LTT is an acronym for Learning/Teaching/Training within Erasmus+ projects. This tool helps in registering LTT Activities within the project. Enter the LTT Activity Number, as in the proposal. Click Create a new LTT Activity. Select Activity type from a dropdown menu. Define the length of the activity by selecting if it is a Long-term Activity and type its duration in days. Complete the number of participants, participants with special needs and accompanying persons. From the list of partners select Participating organisations. Provide a description of the activity, as in the application. Click save in the alert box above. Click Create a new Multiplier Event. Insert the title for the ME. Copy the identification code from the project’s proposal. In the IO(s) covered type, put in the identification code of Intellectual Outputs shared during the Multiplier Event. Choose the county of venue for the ME. Set ME start and end dates. Provide a short description, as in the proposal. Click save in the alert box above the form. To add new activities within MEs, proceed as instructed in the Intellectual Outputs. These activities are related to Key Action 1 of Erasmus+ programme. The main focus is mobility for education and this module is ready to register all such activities. Start with creating your first activity. Click Create a new Activity. Enter the Activity’s number, as in the proposal. From the dropdown menu select the type of activity. Type in the number of participants. Select whether it is a Long-term activity or not which will determine whether to break down trips into Flows, given in months or days. Complete the fields with the number of participants, participants with special needs and accompanying persons. Click the arrow on the right to expand the field and click Add a new flow. Add the flow number, as in the proposal. Fill in the row with origin and destination countries, duration of activity and the number of participants. After all fields are completed, click Save. Under the Finances tab you will find four sections devoted to managing your expenses. Due to the requirements of EU projects, everyone has to deliver a proper report to their financing body. There is always more than you’d think is enough and it has to be done properly if you want your funding, no excuses. Every person who’s ever managed an EU project will probably agree that apart from time and task management (we have yet another article on that matter), reporting is something that can make you cry. That is the reason for inclusion of exporting tools in AdminProject’s financial tools. All the sections of Finances have an engine that generates a report in a .docx. format and if you are happy with it, just send it to your financing organisation. Unless otherwise stated, all amounts should be given in Euro (EUR). Timesheets are a way of recording the amount of time each person spent working on a project to determine staff costs. They are normally filled by a project manager or coordinator, though in AdminProject everyone can create and fill in their own timesheets and keep them up-to-date as the project progresses. When you want to enter Timesheets there are two options. One is to Add a new employee and the second Check my timesheets – both available on the sidebar. First of all, each user has a personalized view of all their monthly timesheets. The information here is collected from all projects you are participating in at any given moment. Clicking Show my timesheets will unfold into a breakdown of your timesheets across all your projects. You can come back to the main view by clicking Employees list. You can also Check timesheet by IO. Make sure the person you want to add is on the users list (Project’s Home > Settings). Check if the user has a partner assigned (Project’s Home > Settings > Project partners). Employee – pick one from the dropdown list. If you are a regular user you can only pick yourself. The partner field will be filled automatically. Position – name the role a person plays in the project (usually its Technical, Administrative or Managerial). Daily rate – how much does this person cost for a day’s work on the project (in EUR). Timesheets are added to employee files. Click on the name of the person you have just added and click Add a new timesheet. Select the month for the new timesheet and click save. The timesheet is ready to be filled with the employee’s activities. Click on the timesheet. Click Add a new activity. Pick a date for the activity. If an activity spans more than one day it is good practice to add it as a separate activity. Select WP or IO for the activity. Type the name for the activity. Enter the time spent on the activity. The time is in fractions of a full-time day of work, its length depends on the country (e.g. 8 hours or 7.5 hours), i.e. if an activity took 4 hours in an 8-hour-day type 0.5. This is another section for controlling your project finances. Click Add a new staff cost to start creating a list. You must select the partner, a relevant IO, company position and then insert the number of days. The cost wil be automatically calculated. Afterwards, click save. Remember, costs are for each full-time day of work, so when you intend to report half-a-day, then type 0.5. Generally, reporting for EU funded projects includes travel expenses. That is, if you want them covered by the grant they need to be well documented and justified. Right after you click Travel reports you will see the list of all trips under this project. Reporting travels can be tedious, so AdminProject will help in keeping the documents in one place and generating a report. Start and end dates of the trip. Select the partner whose expenses are documented. Insert number of people travelling. If applicable, select the work package related to the trip. If applicable, link any relevant files. You will need see the list of reported travels with cost per trip at the end of each row. Travel data can be edited at any time. This section covers costs incurred from realisation of activities that are not covered by the previous sections. These may be expenses arising from a Grant agreement or budget shifts. The difference is that Other costs were a part of LLP projects and Exceptional costs are a part of Erasmus+ projects. Click on the Add a new exceptional cost button. Then choose relevant partner, item description, justify cost purpose, select cost date (from invoice), enter cost in currency, currency code and exchange rate. Afterwards, click save. Dissemination is always one of the fundamental elements of every European project. The EU governing bodies want project beneficiaries to reach out to individuals and organisations concerned and inform them about the progress of the project and its results. Dissemination activities are actually informational campaigns within the project and a designated module within AdminProject will help you record when they were done, who was the recipient and what was the method used. Here is an instruction on how to register a dissemination activity. Fill in the basic field: Activity name. Choose reporting partner – Who? Choose between types of dissemination activities from the dropdown menu – How? Select date of dissemination activity – When? Choose the level/span of the activity. Make a note of the location of the activity – Where? Enter the number of people who were targeted by the activity and received information about the project and/or its results. Provide a short description in Activity description. Provide short information in the Impact of the activity. (optional) Include information on Feedback received. The files attached to dissemination activities will be placed in the Dissemination system folder which holds all dissemination evidence. The main purpose of recording all dissemination activities is to generate a report. In the main Dissemination module view, there is a list of all dissemination activities undertaken by all partners. Each report will summarise activities of only one partner. Click Show summary on the sidebar. The new list shows every partner and the number of their activities. Click download in the Report column for the selected partner. AdminProject will generate one report per partner. Each report will include every logged dissemination activity with all provided in this respect in AdminProject data and recognized files. You can still attach other types of files, though they will not be compiled into the report. File types that will be added to a dissemination report: jpg, gif, png, docx and pdf. Under this label, we have hidden a powerful editor and survey tool that can help in the evaluation of the project and its activities. Each user can create surveys fill them with questions, publish them online and collect the results. Successful evaluation depends on the accuracy of the surveys, as the way they are prepared can determine the answers received from respondents. Step 2 – Fill the optional fields. Yes or No question – where a simple and clear binary answer is required. Scale – where a question in each row requires one answer from a fixed set of columns. You can ask your respondents to provide a different answer for each row. Matrix – a deeply structured question where for each set of conditions determined by one column and one row, there is a dropdown menu with a set of possible answers. Multiple choice – where several answers can be ticked to answer one question. Single choice – where a respondent picks one answer from the options given. Text – for short text answers that would not exceed one line of text. Paragraph text – for longer text answers. The last option is not really a question. Section header helps with organising your questionnaires and divides blocks of questions into sections. You can choose if an answer to the question is required to complete the survey. A longer description can be added to the question (especially useful if you want to provide a broader context). To reorder your questions use up and down arrows next to each question’s number. Questions can be removed by clicking remove this question link near the right margin of each question. If you want to preview your questionnaire use Preview survey in a new window link on the Action sidebar. When the survey is ready or you want to take a break from designing your questionnaire, click save. Editing – click on the survey’s name to continue editing the questionnaire. Preview (new window) – displays a new window to see what it would look like for respondents. Publish – makes the questionnaire available to the general public. It is going to be available to those who are given a link to the survey. Remove – deletes the draft. Preview (new window) – displays a new window to see what it looks like for respondents. Show survey link – Displays a unique link to the survey. You can copy the link and distribute it to your respondents. They don’t have to have an account on AdminProject. Finish the survey – Locks the survey and no new responses can be added. The last button in the Evaluation module takes you to the list of all surveys. There are both unpublished and published surveys and both closed and those still open for responses. The results of each can be viewed by clicking on the name of the survey. The link to your user profile is located in the top-right corner. In General tab, one can complete their profile with details like: website, contact details and a few words about oneself. This is also the place to change your password and view the list of projects that you have been invited to or are owning – projects listed according to project duration, your role and insight into the list of involved staff. Finally, this is also where you can view your current subscription plan with information on subscription starting date, remaining days and ending date. Here you will also view Billing history. The Notifications tab lets you configure what e-mails are sent to you by AdminProject. This is the command center for all messages that you receive from AdminProject. Discussions. You will receive an e-mail whenever a new discussion is created and the author included you in the subscribers list (everyone is selected by default, the author can deselect people he does not want to bother). You will also receive an e-mail every time someone replies to a topic you are following. New comments. Works in a similar way. You will receive an e-mail each time somebody comments on a task with you in any role (owner, person responsible, observer). Tasks. Whenever anything is modified in a task (change of dates, description, new files, change of participants, change of progress) an e-mail will appear in your inbox with information about the changes. Don’t send me notification when I respond via email – when you use e-mail as your way of interacting with your team via AdminProject. If No is selected the e-mail will not only appear under a discussion or task, it will also come back to your inbox as a notification. Don’t notify me about my actions – if switched to No, you will start receiving e-mails reflecting your activity in tasks or discussions you participate in. The next option is a subscription to AdminProject’s newsletter about updates. We use it mainly to communicate important changes or planned outages. The remaining four options and the weekdays concern to-do list notifications. You can decide when should these notifications arrive (time and days of the week) and what should they include.